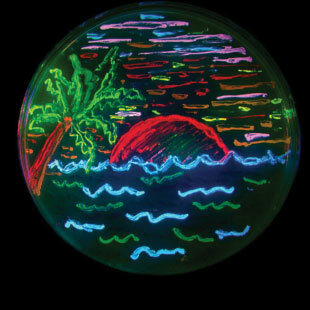 IN LOVING COLOR: An agar plate of fluorescent bacteria colonies created in Roger Tsien’s lab. I’ve always been attracted to colors. Color helps make the work more interesting and endurable. It helps when things aren’t going well. If I had been born colorblind, I probably never would have gone into this. Rarely are the smartest people the most creative too, but Roger was both. We take no sides between the traditional subscription model and the open-access model. We believe both of them can be done in a fair, open, clear, and lawful way. What we have a problem with here is people who are trying to benefit from the open-access model to scam people. Brain size has increased about 350 percent over human evolution, but we found that blood flow to the brain increased an amazing 600 percent. We believe this is possibly related to the brain’s need to satisfy increasingly energetic connections between nerve cells that allowed the evolution of complex thinking and learning.